← Su Casa Festival – On Conwy Quay. Fans of good ol’ rock ‘n’ roll music will be thrilled to know that the number one established Eagles Tribute band is coming to our very own Llandudno. 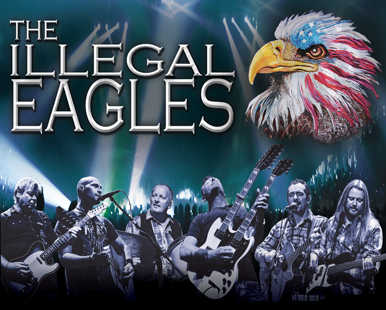 The World’s Number 1 Eagles Tribute, ‘The Illegal Eagles’, a well-established rock and roll band are making a return for another awesome show. The band’s delivery has been called ‘Flawless’. They will be playing the 14th of September 2016. You may have heard about the recent, tragic passing of Eagles Guitarist Glenn Frey, one of the original founding members of the band. In honour of his memory, a touching special tribute will be included in the set. Get ready for emotion. Catch them on the Llandudno leg of their new UK wide tour, we are fortunate enough to have the music of the Eagles delivered to our gorgeous seafront for all to hear. Tickets are £25, and you can purchase them from here. The first half of 2016 meant an awesome period of explosion for The Illegal Eagle, with shows breaking box office records, with the continued musical expertise and finesse applied by the extremely skilled band members. With the addition of new members, the sound has been brought even closer to that unmistakable Eagles sound. The wonderful thing about this location is its proximity to all of Llandudno’s seafront Hotels famous white walled Victorian as they are, which over the years has garnered attention of many different visitors to this ‘Queen of Welsh Resorts’. The Cae Mor Hotel for example is right next-door, and so is the perfect spot to crash after a night of rock n roll. This entry was posted in Activities, Attractions, Local Areas, Local Events, Local News. Bookmark the permalink.